Rufus Porter is certainly one of the most unique folk artists of the 19th century. Though he had only minimal formal schooling, Porter was a writer, editor, mechanic, inventor, muralist, portrait painter, publisher and visionary. He created Scientific American, which remains in publication as one of the oldest continuously published magazines in American history. He tinkered with a flying machine. He wrote an art instruction book that went through six printings. Though his advertisement, Correct Likenesses, Taken With Elegance and Dispatch By Rufus Porter is a staple of books about 19th century folk portraits, Porter is best known for his murals which featured views of the American countryside. Yet, Porter had an accomplished hand as shown in the minutely detailed portraits, which have been attributed to him. Hair and garments are carefully delineated and unforgiving watercolor medium is deftly applied as shown in this image. He was born in West Boxford, Massachusetts in 1792 but moved with his family to Maine in 1804 when still a boy. He entered Fryeburg Academy but remained there only six months, ending his formal education at the age of twelve. He lived in Portland, earning his living first as a musician and then as a house and sign painter. While his scenic murals were among his most admired achievements, he also traveled from Maine to Virginia executing portraits and silhouettes as well as landscape paintings. He switched primarily to mural painting in 1824 . . . presumably he saw it as being a better opportunity. 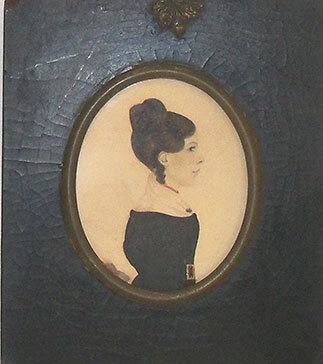 His miniature portraits were the embodiment of his painting techniques and are clearly recognizable as "his" though rarely signed. They were side views painted in full colors. He used a stippled modeling technique on the sitter s face, aware of the many pitfalls to be avoided because of his extensive painting experience. By 1845 he had given up painting for his new career in science and invention. Our sitter is identified on the back as Miss Milby and appears to be a young woman of some means as evidenced by her clothing and jewelry. She wears a black dress with coral jewelry and an elaborate belt buckle. She has a calm serenity about her and is really quite lovely.